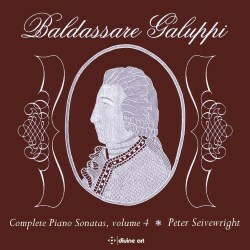 Peter Seivewright has spent much time researching Baldassare Galuppi’s piano sonatas. Visits to Venice and other European libraries have yielded several unpublished scores, from which performing editions have been prepared. As I understand it, Seivewright began this project back in 1998, so it has been running for nearly 21 years. The present CD features eight sonatas as well as a bonus piano concerto. It follows on fourteen years after the previous volume. So far, Seivewright has laid down some 33 sonatas. The present CD is number four in a series originally intended to include all 100-plus sonatas that were currently in the catalogue. This number has now risen to about 130 sonatas as more have been discovered. I understand that this project is now back on target. A few words about Baldassare Galuppi. He was born on the beautiful island of Burano in the Venetian Lagoon on 18 October 1706. He is best recalled as a composer of opera, of which he wrote some 109. Historians will be fascinated to learn that he visited London in 1741-3 and gained a considerable reputation at the King’s Theatre, Haymarket. He held the post of assistant choirmaster at St Mark’s in Venice, subsequently becoming choirmaster in 1762. Galuppi visited St Petersburg for an extended stay between 1764 and 1768 at the behest of Catharine the Great. Returning to Venice, he resumed his post at St Mark’s His other musical compositions include oratorios, church music and the above-mentioned corpus of keyboard sonatas. Baldassare Galuppi died in Venice on 3 January 1785 and was buried in the Church of St Vitale in that city. It is a lovely church that I have walked past many times on my way to the Gallerie dell’Accademia – but have never been inside. I own to being confused about Galuppi’s sonatas. I cannot work out whether there are separate sonatas for harpsichord, clavichord and piano, or whether these are the same pieces realised on different instruments. The Sonatas have been awarded an Illy number, which, unfortunately are not included in the track-listing. This numbering was generated by Hedda Illy who is/was bringing out a complete edition of the sonatas published by De Santis. Another catalogue of Galuppi’s keyboard sonatas was prepared by David E Pullmann (published 1972). I do not have access to this information. So, it is difficult to pin down exactly what I am listening to. The form and style of these piano sonatas runs the gamut from baroque to classical and even pushes towards early romanticism. Galuppi has been regarded as a precursor of Schumann, Weber and Felix Mendelssohn. Some of these sonatas are conceived as single movements echoing the practice of Scarlatti, and others have two, three and sometimes even four movements, looking forward to Haydn and Beethoven. They are all quite pleasant to listen to, without in any way being revelatory. As a bonus, the Piano Concerto in D major has been included. There are eight works of this genre in the catalogue. The form of this present example is the conventional fast-slow-fast pattern which was established as the norm by J.S. Bach and others. It is an enjoyable piece that is structurally balanced and always extremely lyrical. The liner notes appear to digress and discuss the Piano Concerto in D major rather than the present example. Furthermore, these notes do not seem to give an overview of Galuppi’s keyboard music. This may, perhaps, have been included in earlier releases (21 years ago). Peter Seivewright, born 1954, studied at Oxford University and then at the Royal Northern College of Music. He has had a successful career as a concert soloist and recitalist. Seivewright is also highly regarded as a teacher, working world-wide in musical institutions from Scotland to Trinidad and from Afghanistan to Phnom Penh, Cambodia. The playing by Peter Seivewright and the Scottish Baroque Soloists (in the concerto) is excellent. There is always clarity of line and fluidity of invention. I do wonder if everyone will be happy that these performances are played on a ‘modern’ Bösendorfer Imperial Concert Grand rather than a contemporary forte-piano. For my part, I prefer my baroque played on the piano. I was concerned that the piano was a little clattering at times and possibly a touch boxy. I did feel that a mere 50 minutes of music was mean. Surely there was more that could have been included. In 2011 Naxos began issuing an edition of Baldassare Galuppi keyboard sonatas played by pianist Matteo Napoli. It appears to have become stuck at Volume 3 which was released in the following year. I have not heard these discs.